This project by Walker & Pride Architects is an example of growth and change within the traditional streetscape of St. Andrews. 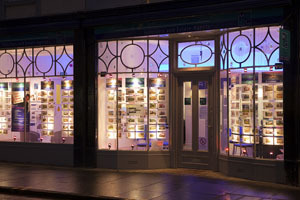 Modern commercial premises have been created by the imaginative refurbishment of two existing shops, respecting and enhancing the frontages while completely re-modelling the interior. This was a challenging project due to the complexity of the interior alterations. The interior has been completely transformed including the creation of an open plan office in the back area previously used as a store. R.B. Grant installed the new lighting, data and power to the specific design. 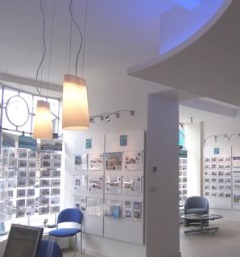 The use of modern LED and neon lighting for aesthetic purposes enhanced the look and feel of the office. Emergency lighting, security and fire alarms were installed to meet current electrical and safety at work act compliance. The shop premises at 19-21 Bell Street were originally built as two separate shops. No. 21 has a central doorway and a bow frontage on either side with delicate patterned astragals. The adjacent shop at No. 19 was smaller with a door to the right and a plain window to the left. The premises were previously occupied by Oxfam who have relocated their business elsewhere in St. Andrews and the solicitors Murray Donald Drummond Cook LLP have taken the opportunity to bring all their property staff together in one location for the first time.